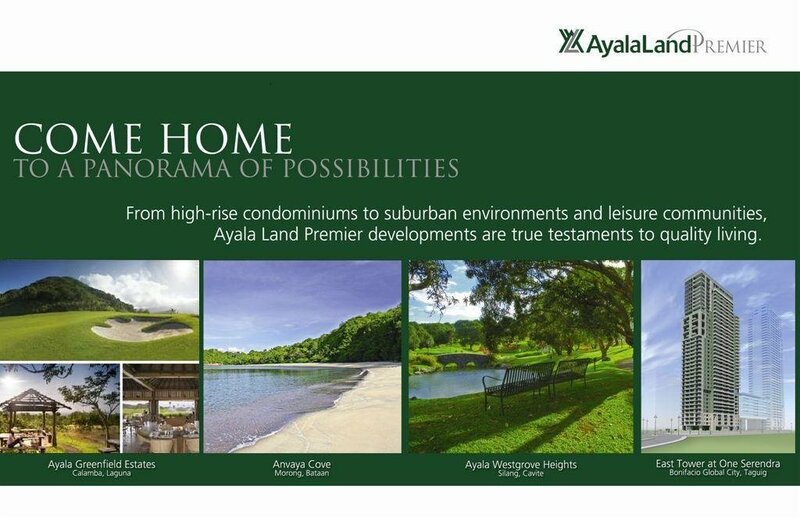 Ayala Land Inc.(ALI)是菲律賓最大的房地產開發商, 在全國經營頂級商業不動產, 是由Ayala集團所擁有. Ayala Land在菲律律策略發展的成長地區, 開發住宅、商業店面、辦公樓、飯店和休閒度假村. 是菲律賓最有歷史和最大的企業集團之一的Ayala Corp.所擁有的不動產部門. Ayala Land最初從Ayala Corp.一個集團的部門, 發展到在1988年獨立成為股票上市公司, 在菲國的股票市場PSE代號ALI. Ayala Land的核心業務為策略性的土地銀行業務、住宅開發、購物中心、辦公大樓、飯店. Ayala Land開發的相關的業務有, 建設和物業管理. 在2012年4月, Ayala Land和Metro Pacific Investments Corporation太平洋地鐵投資公司聯合在全國建設鐵路. The two Bonifacio Ridge buildings in Bonifacio Global City, Metro Manila. Left: Cypress Point, right: Spanish Bay. One Serendra and the southern part of the Two Serendra (foreground) blocks of houses in Bonifacio Global City. The groundworks for the Meridien buildings at High Street South in Bonifacio Global City, on May 1st, 2013. St. Alexandra Estates, St. Gabriel Heights, Avida Residences San Isidro, Avida Residences Sta. Monica, Avida Residences The Yards of Sta. Monica, Hacienda Sta. Monica, San Antonio Heights, San Rafael Estates, Avida CityFlex Towers BGC, Avida Towers 34th Street, Avida Towers BGC 9th Avenue, Avida Residences Sta. Arcadia, Avida Settings Cabanatuan, Centrio Tower, Avida Residences Dasmariñas, Avida Residences Santa Catalina, Avida Settings Cavite, Avida Village Santa Cecilia, Avida Towers Cebu, Avida Village Iloilo, Avida Tower Iloilo, Avida Village North Point Bacolod, Avida Parkway Settings NUVALI, Avida Settings NUVALI, Avida Village Cerise NUVALI, Ridgeview Estates NUVALI, Santa Rosa Estates, Avida Towers Makati West, Avida Towers San Lorenzo, Avida Towers Centera, Avida Towers Intima, Avida Towers San Lazaro, Avida Towers Alabang, San Alfonso Homes, San Francisco Village, San Ignacio Estates, Avida Village North Point, Avida Residences San Fernando, Avida Towers Sucat, Avida Towers Prime Taft, San Juan Estates, Santa Barbara Homes, Santa Isabel Village, Avida Towers New Manila, Regio de Dios Village, St. Joseph Homes, St. Jude Village Makati, Rancho Imperial,Madera Grove Estates Malolos. Ayala Land Hotels & Resorts, Corp.
Maria Rowena M. Tomeldan, Ayala Land vice-president, said that in 2013, they would develop $172 million worth of shopping complexes and retail developments.